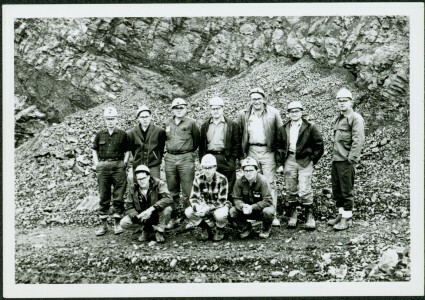 Photograph depicts group of ten men standing and kneeling in unknown location at the Cassiar mine. Handwritten annotation on recto of photograph: "APPROX 1965 / BACK L-R / 1.- / 2. Don Erwin [i.e Irwin] / 3. MAC MAcCLOUD DIED 1979 / 4. JIM MURDOCK MINE SUPER / 5. RUPERT McKENZIE CAPT / 6. DANNY DEMETRI / 7. VIC SARAKOSKI / FRONT. L-R / 1. DON HUDGEON / 2. MIKE CLARK / 3. - [Adrian VanHill Sr.]". Information in above annotation supplemented with insight from individuals who contributed to Northern BC Archives Facebook Photo ID Project, contact archivist for more information in research file pertaining to this photograph. Item is part of the Cassiar Asbestos Corporation Ltd. fonds. Image is one of 45, see items 2000.1.1.3.19.33 - 2000.1.1.3.19.77. See also item 2000.1.1.3.19.71 for image featuring similar content.